This book uses a practical approach in the application of theoretical concepts to digital communications in the design of software defined radio modems. 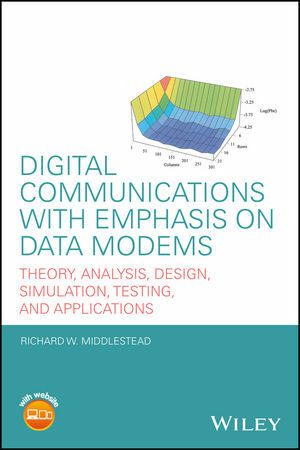 Digital Communications with Emphasis on Data Modems is a great resource for communication-system and digital signal processing engineers and students looking for in-depth theory as well as practical implementations. Richard W. Middlestead currently works on miniature, low-cost, software radio communication solutions at Vulcan Wireless, Inc. in Carlsbad, California, USA. He received his BSEE degree from Lafayette Collage and his MSEE degree from Drexel Institute of Technology. He has also completed postgraduate courses at Temple University and the University of California at Irvine. He has worked in the industry for 56 years contributing to the analysis, design, simulation, and testing of commercial and military communication and radar systems at various corporations, such as, the Philco and Philco-Ford Corporations, Collins Radio and Collins Communications System Division of Rockwell International, Telecommunication Science Associates, Inc., the Martin Marietta and Lockheed-Martin Corporations, and the Linkabit Division of the Titan Systems Corporation. Mr. Middlestead is a member of the National Society of Professional Engineers (NSPE) and a senior member of the Institute of Electrical and Electronics Engineers (IEEE).